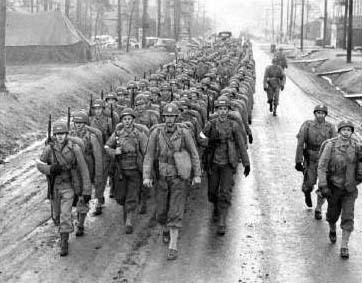 Between March 1943 and September 1946 Greensboro was home to the country's largest military base within the limits of any American city; more than 330,000 soldiers passed through its gates. Built on 652 acres on the city's east side, the eventual Overseas Replacement Depot began as the Army Air Force's (AAF) Basic Training Center No. 10. It was conceived by the AAF's Technical Training Command, at that time operating out of the Pilot Life complex in Sedgefield; the command's plans called for a facility large enough to train and mobilize the tens of thousands of crewmen needed for the air war in Europe and Asia. Strategically located, surrounded by the necessary transportation and support facilities, and willing to develop the large tracts necessary for the project, Greensboro was awarded the base in 1942. Basic Training Center No. 10 opened on 1 Mar. 1943. Trainees endured from four to eight weeks of intensive training in weapons, drill, physical fitness, and chemical warfare. Airmen then left for advanced training at other bases prior to assignment in combat theaters around the world. Among the 87,500 trainees who passed through the facility were members of the Women's Air Corps, whose six-week stints trained them in a variety of administrative and support fields. The center also trained African American airmen, a fact that displeased some of Greensboro's citizens. Black servicemen were segregated, and despite their repeated requests for equal treatment as military personnel, their training was restricted to support services and labor battalions. The focus of the center shifted in 1944, when it became the AAF's principal Overseas Replacement Depot (ORD) on the East Coast; it served in this capacity until the end of the war. By 1 May, with trained airmen available in sufficient numbers, ORD processed personnel for rotation to overseas combat operations. In August 1945 the ORD was also designated AAF Redistribution Station No. 5 and assumed responsibility for reassigning returning soldiers to other posts in the United States. In September 1945, the ORD became a major discharge center and processed thousands of returning veterans. When it closed in September 1946, the Bessemer Improvement Company bought 433 acres of the ORD land, along with nearly half of the buildings, and opened the area to residential development. J. Stephen Catlett, Army Town: Greensboro, 1943-1946 (1994). Greensboro Overseas Replacement Depot, NC Historical Marker J-73: http://www.ncmarkers.com/Markers.aspx?ct=ddl&sp=search&k=Markers&sv=J-73%20-%20GREENSBORO%20O.R.D. Basic training at the Greensboro ORD. Photo from Greensboro Historical Museum. (accessed August 30, 2012). Thank you so much for taking the time to let us know about this. I have just updated the link. looking for a man who was at this depot in may or june of 1944. is this site a good place to start?